Proactiv, also known as Proactiv Solution, is a brand of skin-care products developed by two American dermatologists, Katie Rodan and Kathy A. Fields, and launched in 1995 by Guthy-Renker, a California-based direct marketing company. The range includes moisturizers, body washes and hair products, but the brand is known for its three-step anti-acne kit consisting of a cleanser, toner and lotion. 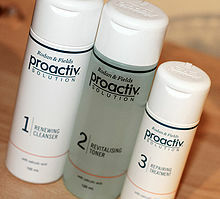 Proactiv+, a reformulation of the three-step kit, was introduced in 2013. As a result of its celebrity endorsements and infomercials, Proactiv is one of the most popular skincare brands of all time, according to the Journal of Clinical and Aesthetic Dermatology. Sales amounted to $800 million a year as of 2010, with a media budget of nearly $200 million and $12–15 million for celebrity fees. The product is mostly sold online as part of a continuity program. A month after ordering, customers are sent a three-month supply, which continues until the subscription is cancelled. Customers have complained that the subscriptions are hard to cancel. According to a 2011 review, there have been few studies on the efficacy of Proactiv. A 2011 Consumer Reports study compared Proactiv with two less expensive types of benzoyl peroxide, AcneFree and OXY Maximum, and found all three to be equally effective. The US Food and Drug Administration warned in 2014 that over-the-counter acne treatments can cause severe irritation, as well as rare but life-threatening allergic reactions. Proactiv was created in the late 1980s by Katie Rodan and Kathy A. Fields, who met while at Stanford University School of Medicine. Proactiv was offered to Neutrogena, which declined it, but its CEO, Allan Kurtzman, suggested selling it via infomercials. Guthy-Renker were already in the infomercial business and agreed to market and distribute it. The first infomercial appeared in October 1995, offering a money-back guarantee and fast delivery, and featuring Judith Light, who suffered from acne problems herself. Rodan and Fields later founded their own skincare brand, Rodan + Fields. Guthy-Renker LLC is a direct-response marketing company registered in Palm Desert, California. Founded in 1988 by Bill Guthy and Greg Renker, the company is known as "the Rolls Royce" of the infomercial industry. As of 2012 its portfolio of products was making $1.8 billion a year. The range includes Victoria Principal's Principal Secret skincare (its earliest skincare brand), Wen Hair Care, Cindy Crawford's Meaningful Beauty skincare, the Dean Martin Celebrity Roast DVDs, and the Malibu Pilates Chair. In March 2016, Nestlé joined Guthy-Renker as a majority owner of Proactiv. Proactiv is a registered trademark of Guthy-Renker. The brand's primary product is a three-step kit comprising a cleanser, toner and lotion, which sells for $20 a month in the United States if purchased as part of the continuity program. The toner contains glycolic acid, an exfoliant, and witch hazel, an astringent. The active ingredient in the cleanser and lotion, outside Europe, is a 2.5% concentration of benzoyl peroxide, lower than in most prescription-strength acne treatments. [n 1] Benzoyl peroxide has been used since 1934 to kill Propionibacterium acnes, the bacterium that causes acne. Several over-the-counter acne treatments contain it, including Clean & Clear, Clearasil, Doctor's Dermatologic Formula, Neutrogena Advanced Systems, PanOxyl and Stridex. There is also a three-step program in Extra Strength, with a 7% concentration of benzoyl peroxide, and a Gentle Formula that instead contains a 2% concentration of salicylic acid, an exfoliant. The three-step kit in Europe is based on salicylic acid; in the UK it costs £39.99 ($60) for a two-month supply. [n 2] Other Proactiv products include an oil-free moisturizer that uses octinoxate (7.5%) and zinc oxide (3%), and an anti-dandruff shampoo with a 1% concentration of zinc pyrithione. Guthy-Renker introduced Proactiv+ in 2013, charging $30 in the United States for a month's supply if the customer creates a subscription. It is a paraben-free three-step kit comprising a cleanser and toning gel, each with 2.5% benzoyl peroxide, and a moisturizer with salicylic acid. It is reportedly more hydrating than the original program. 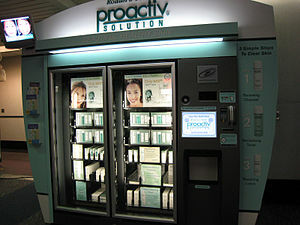 Proactiv is aimed at customers with mild to moderate acne. According to a 2011 review, there have been few studies examining its efficacy. A 2007 study saw inflammatory lesions reduced by 39% in subjects using a combination of butenafine and benzoyl peroxide, compared with 34% in those using Proactiv containing only benzoyl peroxide. A physician suggested in Salon that its three-step system might make it easier for teenagers to comply, but that the key to its success lay with its celebrity endorsements. In 2011 Consumer Reports compared Proactiv (2.5% benzoyl peroxide) with two less expensive products, AcneFree (2.5% benzoyl peroxide) and OXY Maximum (10% benzoyl peroxide). At the time a two-month supply of Proactiv cost around $40 in the US, AcneFree $20 and OXY Maximum $5. Eighty-three subjects, aged 14 to 40, used one of the products twice a day for eight weeks. The magazine reported that, no matter which product was used, after two weeks around 75% of subjects saw a 35% reduction in blemishes on average. After eight weeks around 50–66% saw a 40% reduction on average. Benzoyl peroxide can have a drying effect on the skin, can cause erythema (redness) and fine scaling, though these effects are usually mild, and can increase sensitivity to sunlight. One in 500 may experience allergic contact dermatitis. It is categorized as a pregnancy category C agent, "suggesting that its use in pregnancy may not be prudent," according to a literature review in the Journal of Clinical and Aesthetic Dermatology. [n 3] If benzoyl peroxide comes into contact with clothing it is likely to bleach it. The US Food and Drug Administration (FDA) warned in 2014 that over-the-counter acne products containing benzoyl peroxide and/or salicylic acid, including Proactiv, can cause severe irritation, as well as rare but life-threatening allergic reactions. Consumers were advised to stop using the products if they experience hives or itching, and to seek emergency medical attention if they feel faint, or experience throat tightness, breathing problems, or swelling of the eyes, face, lips or tongue. The FDA noted that it remains unclear whether the reactions are caused by the active ingredients, inactive ingredients or a combination. Proactiv is marketed and distributed by Guthy-Renker, and is responsible for about half the company's revenue. Sales of Proactiv amounted to $800 million as of 2010. 70% of sales were in the United States as of 2007. The product is available in some stores, including Boots in the UK, and in kiosks and vending machines (known as ZoomShops) in malls and airports through a partnership between American Kiosk Management and Guthy-Renker . But the product is mostly sold online or through a toll-free number directly by Guthy-Renker; 60% of Proactiv orders were placed online as of 2010. Guthy-Renker sells Proactiv as part of a continuity program, also known as a negative-option offer, whereby customers are sent repeat orders until they cancel. When purchasing directly from the company, customers automatically become members of a Proactiv club. A month after ordering, and every three months thereafter, they are sent a three-month supply costing $60 (in the US as of 2011), plus shipping and handling. They are billed monthly until they cancel the subscription. The approach is based on the customer lifetime value model. Customers have complained that they have created subscriptions inadvertently and found them difficult to cancel. The most common complaints about Guthy-Renker, according to Truth in Advertising, are unauthorized billing, difficulty cancelling orders, billing for products that never arrive, unhelpful customer service, and refusing refunds despite money-back guarantees. Guthy-Renker had a media budget of $200 million for Proactive as of 2010, much of it spent on air-time, and was spending another $12–15 million a year on celebrity endorsements. Justin Bieber for example, was paid $3 million over two years. Its infomercials have featured celebrities who have themselves suffered from acne problems; the list includes Kelly Clarkson, P. Diddy, Avril Lavigne, Lindsay Lohan, Alyssa Milano, Katy Perry, Jessica Simpson, Britney Spears and Vanessa Williams. According to the New York Times, until 2010 Proactiv infomercials were "fast-talking" and "hard-selling"; an announcer repeatedly advised viewers to "call now," and offered faster shipping if the order was placed within three minutes. As infomercials became less popular, Proactiv sales stalled. Since 2010 Guthy-Renker has tried to move the brand into the mainstream cosmetics market, focusing on quality rather than price. It began advertising on network television during shows like American Idol, and in Elle, InStyle and People magazines. In 2012 the Advertising Standards Authority (ASA) in the UK banned some of Proactiv's advertising as misleading. A viewer complained that the celebrities were likely to have used the US version of Proactiv, which differs from the UK version. According to the ASA, the celebrities had signed statements saying they had used the UK version for a few weeks one to three years earlier, but the advertisements gave the appearance that they had continued to benefit from it, so the viewer's complaint was upheld. ^ John Kraft, Anatoli Freiman (Canadian Medical Association Journal, 2011): "Benzoyl peroxide is available in various topical preparations, ranging in strength from 2.5% to 10.0%. Any strength can be used initially, although it may be more prudent to start with a lower concentration; stronger preparations are more irritating and not necessarily more effective." ^ As of 2015 Boots the Chemist in the UK charges £39.99 ($60) for the Proactiv Solution cleanser (120 ml), toner (120 ml) and lotion (60 ml). ^ Ashley Decker, Emmy M. Graber (Journal of Clinical and Aesthetic Dermatology, 2012): "Since the 1930s, BP [benzoyl peroxide] has been a popular choice for the treatment of AV [acne vulgaris] due to its keratolytic, moderate comedolytic, and antibacterial properties, which include the reduction of P. acnes and Staphylococcus aureus on skin. Cutaneous side effects of BP are most often irritant in nature, may be concentration and/or vehicle dependent, and are usually mild, including signs such as dryness, erythema, and fine scaling. A minority of the population treated with BP for AV will experience true allergic contact dermatitis (1:500). Although available OTC, BP is a pregnancy category C agent, suggesting that its use in pregnancy may not be prudent." ^ a b Grettler, Corinne (March 24, 2016). "Nestle Forms Alliance With Bieber's Fave Acne Cure Proactiv". Bloomberg. Retrieved April 11, 2016. ^ Katie Rodan, Kathy Fields (2008). Unblemished, Simon and Schuster, pp. 4–8. ^ a b "List of Proactiv products and their ingredients". DailyMed, National Institutes of Health. ^ a b Marianne Mychaskiw (January 29, 2013). "Proactiv Launches Proactiv+ Line, More Hydrating Formula". InStyle. ^ a b Decker Ashley, Graber Emmy M (2012). "Over-the-counter Acne Treatments". Journal of Clinical and Aesthetic Dermatology. 5 (5): 32–40. PMC 3366450. PMID 22808307. ^ a b c d Rose Lacey (November 3, 2010). "Shill Shocked". Forbes. ^ a b c d Ric Romero (November 7, 2011). "Which Acne Treatment Works Best, Costs Less?". ABC7. ^ a b c "Five Common Complaints about Guthy-Renker", Truth in Advertising, June 25, 2013. ^ a b "Over-The-Counter Topical Acne Products: Drug Safety Communication - Rare But Serious Hypersensitivity Reactions", Food and Drug Administration, June 25, 2014. "Topical Acne Products Can Cause Dangerous Side Effects", Food and Drug Administration, June 2014. "F.D.A. Warns of Allergy to Some Anti-Acne Products", Associated Press, June 25, 2014. "Potential Signals of Serious Risks/New Safety Information Identified by the FDA Adverse Event Reporting System (FAERS) between July – September 2013", Food and Drug Administration, November 1, 2013, updated September 10, 2015. ^ Rodan and Fields 2008, pp. 4–7. ^ a b Galina Espinoza (July 15, 2002). "Saving Face". People. ^ a b Rodan and Fields 2008, p. 8. ^ a b Meghan Casserly (November 30, 2010). "Proactiv's Active Ingredient: Celebrity". Forbes. ^ Dana Mattioli, Gillian Tan (February 18, 2015). "Skin Care Company Rodan & Fields Pursuing a Sale", Wall Street Journal. ^ a b J. B. Arndorfer (May 2, 2005). "Guthy-Renker gives the infomercial street cred," Advertising Age, 76(18). ^ Bernice Kanner (October 21, 1991). "30 Minutes: Selling with Infomercials", New York Magazine. ^ a b Emma Johnson (September 10, 2012). "As Seen on TV". Success Magazine. ^ "The Top DRTV National and Cable Satellite Rankings", Response Magazine. ^ Kate Lunau (January 8, 2011). "Pretty valuable faces", Macleans. ^ Charles Wesley Orton (May 2001). "Partners in Time: The Guthy-Renker story" Archived 2013-10-22 at the Wayback Machine, Response Magazine. ^ Joanne Kabak (January 30, 2003). "Acne Treatment Helps Some, Not All". Newsday. ^ a b c Natasha Singer (October 18, 2007). "Why Should Kids Have All the Acne? ", The New York Times. ^ Natasha Singer (October 19, 2007). "The lucrative business of pimples; Proactiv ad campaign transforms way consumers think about acne". LIFE. pp. D2. ^ a b Fireman Sharon; et al. (2011). "A look at emerging delivery systems for topical drug products". Dermatologic Therapy. 24: 477–488. doi:10.1111/j.1529-8019.2012.01464.x. PMID 22353154. ^ Fluhr J. W., Degitz K. (2010). "Antibiotics, azelaic acid and benzoyl peroxide in topical acne therapy". Journal der Deutschen Dermatologischen Gesellschaft. 8 (S1): S24–S30. doi:10.1111/j.1610-0387.2009.07169.x. PMID 20482689. ^ a b Rahul Parikh (February 28, 2011). "Proactiv's celebrity shell game". Salon. ^ Jessica Wu (2011). Feed Your Face, Macmillan, p. 70. ^ a b "Proactiv Solution 3 Step System To Clearer Healthier Looking Skin" Archived 2015-11-21 at the Wayback Machine, Boots. ^ Tamara Hinson (February 16, 2012). "Proactiv skincare has arrived in the UK – but is it worth your money? ", The Beauty Files, Yahoo. ^ Craig G. Burkhart; Craig N. Burkhart (2007). "Treatment of acne vulgaris without antibiotics: tertiary amine-benzoyl peroxide combination vs. benzoyl peroxide alone (Proactiv Solution?)". International Journal of Dermatology. 46 (1): 89–93. doi:10.1111/j.1365-4632.2007.03081.x. PMID 17214729. ^ Robert M. Kliegman et al. (2015). Nelson Textbook of Pediatrics, Elsevier Health Sciences, p 3231. ^ Stephanie Rosenbloom (May 25, 2010). "The New Touch-Face of Vending Machines". The New York Times. ^ a b Jennifer Netherby (August 20, 2010). "Justin Bieber Joins Proactiv's Zit-Geist". Billboard. ^ Lynda Steele (November 9, 2011). "Testing star-endorsed Proactiv", CTV News. ^ Josh Kaufman (2010). The Personal MBA: Master the Art of Business. Penguin. p. 196. ISBN 978-1-101-44608-9. ^ Amanda Marcotte (January 14, 2013). "Don't Bother With Proactiv", Slate. Jennifer Abel (September 13, 2013). "Acne's hard to get rid of; so is Proactiv", ConsumerAffairs. Katie J. M. Baker (January 11, 2013). "Proactiv Horror Stories: Tales From Skincare's Big Scam", Jezebel. Katie J. M. Baker (January 4, 2013). "Why Is It So Hard to Quit Proactiv? ", Jezebel. Rob Walker (June 12, 2005). "The Celebrity Solution", The New York Times. ^ a b Stuart Elliott (May 4, 2010). "Trying to Move Up From a Fast-Talking, Buy-Now Approach". The New York Times. ^ "ASA Ruling on Guthy-Renker UK Ltd", Advertising Standards Authority, July 18, 2012. This page was last edited on 23 April 2019, at 19:57 (UTC).